For the fifth year, Caring.com has rounded up the most outstanding assisted living and memory care communities in the United States, based on consumer reviews and overall online reputation. 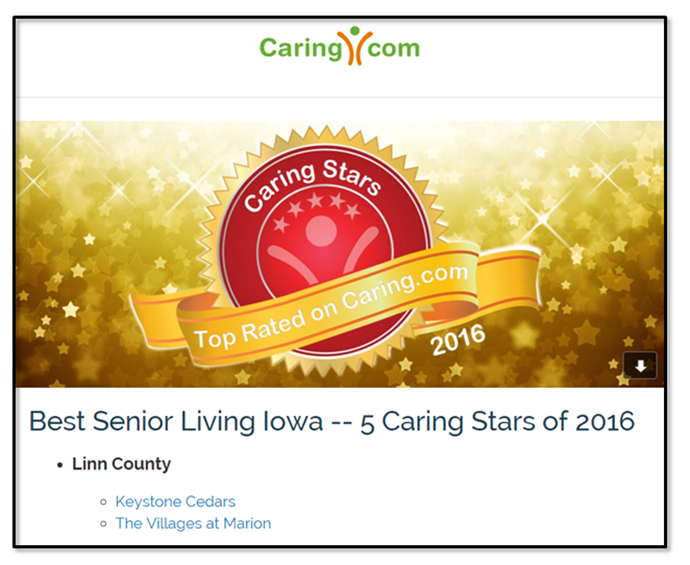 The Villages at Marion is honored to be one of five senior living communities in the state of Iowa to receive this recognition. The Villages at Marion is a warm and inviting home that comes to life with the history and experiences our residents bring, as well as new memories made every day. The approach of The Villages is to treat residents like they are our own family, in a loving and caring manner. We pride ourselves on our care and commitment from our staff to offer a great community for loved ones to call home. A big thank you to everyone that has helped us achieve this great honor.